Lentivectors are widely used in molecular biology, most commonly to transduce in a stable way a desired gene. These vector system takes advantage from the ability of viruses to introduce their own genome in the host cell. Thus the lentivectors are transfected to a producer cell line (typically HEK) and there viruses are produced with the desired insert. Eventually this viruses will be harvested and the desired cell lines transduced. For bio-safety reasons, this system is engineered in a way that that the risk posed by the "virus system" is reduced. Thus the viruses produced by this system are incapable of replication, meaning with this that, as far as I understood, the viruses that are formed are then unable to form more in the second host as the genes in charge are not recruited. Yet, apparently the plasmids used can recombine and pose a possibility to create a replicating capable virus. Yet as far as I found in the literature this has never been detected and stands as a theoretical possibility. My first question, in actual numbers, what is the probability that such event would take place (the number of recombinations in the specific locations). In the case that this would happen, the lentivector system would be potentially dangerous, as this system is based in HIV most of the times. Additionally, this vectors use not the endogenous HIV envelope protein but rather VSV/G from vesicular stomatitis virus, in order to increase the tropism and stability. Additionally, even though HIV derived, most of the HIV genes are taken away from the lentivectors, yet in my opinion the most important ones are there. Second question, taking into consideration all of this, this theoretical "created" virus would be able to eventually cause AIDS or other whatever adverse effect? it is noteworthy that now is able to infect almost all human cells due to the VSV protein, then is it correct to think that the disease would be much worse, and much more contagious than the original HIV? note that even the stability is increased. Yet, I can additionally think that this recombinant new virus may be indeed destroyed by the immune system, despite the increased tropism, due to the fact that vesicular stomatitis virus does not cause pathologies in humans, and possibly this protein works as an antigen and can induce an enough immune response. Last, would theoretical recombinant virus be detected by a standard HIV test? How many recombinations are required to achieve an active virus? The FDA has recognised the likelihood that lentivectors can be converted into actively replicating lentivirus if they undergo recombination with wild type HIV in a HIV positive patient. In this case, two recombination events are required to transfer the lentivector sequence into the HIV sequence (the mechanism of transfer is identical to the case of first-generation lentivectors). This article from VCU describes another mechanism through which this can occur in first generation lentivector systems, which consists of two recombination events between the lentivector and the helper plasmid. 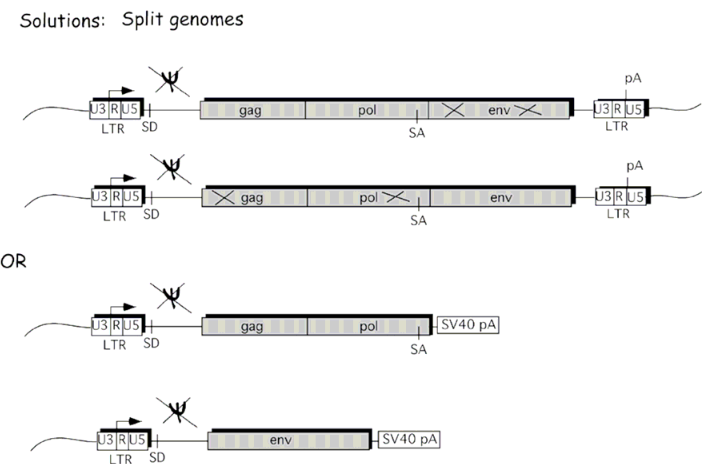 Note that the 3 genes gag, pol and env are present on the same plasmid, and that plasmid is flanked by LTRs. Second generation lentivectors, such as the pLKO system, do not suffer from this problem and require wild type HIV to produce actively replicating lentivirus. To reduce the likelihood of this happening, second and third-generation lentivector systems split the genes into multiple plasmids, which then requires more recombination events to produce replication competent viruses. Additionally, the polyA tail of the 3' LTR is replaced to reduce likelihood of recombination events occurring. According to Addgene's article on lentivector biosafety, the gene of interest's transfer plasmid (both 2nd and 3rd generations) has a deletion in the 3' LTR region which prevents it from becoming replicatively active. Therefore, the only likelihood for the recombination to occur is for the cell line expressing the virus to undergo replication with an active, wild-type HIV strain. An example is this pLKO transfer plasmid, which contains a truncated 3' LTR, preventing the sequence from replicating outside of E. coli, which replicates it not using the LTR but instead using the plasmid origin of replication. Are the active viruses produced by recombinations more dangerous in the wild than wild type HIV? This is difficult to answer, since recombination only allows an active virus to form, but it does not guarantee that the virus will be dangerous. Dangerous viruses are theoretically possible, but require far more recombinations than the minimal 2 for replication competency in 2nd generation lentivector systems. For example, lentivector systems generally do not encode for the viral proteins vpr, vif, nef and vpu. These proteins are necessary for increasing the infectivity of HIV in different types of tissues (but not cultured cells such as HEK293). The lack of these proteins in a hypothetical replication competent lentivector would significantly hamper its spread in the wild. Incorporation of these proteins is plausible but extremely unlikely, since more crossover recombination events will be required. To use your example, the env protein coding for the VSV protein coat resides in the envelope plasmid. 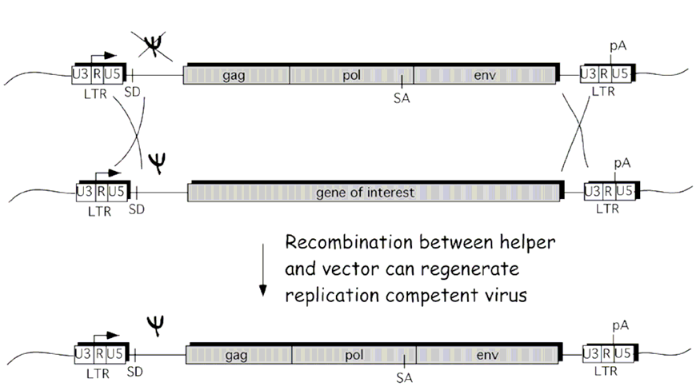 Since the replication competent lentivector formed by 2 recombination events will be a pseudotype containing only the HIV env proteins, it will need to further acquire the VSV gene to replace its env proteins, since these genes are not present on the same regions. There is no homology between the two DNA strands, which would significantly hamper the likelihood of the VSV gene somehow being incorporated into active HIV. The addition of various chimeric proteins and LTR regions in 3rd generation lentivectors only complicates the matter. Overall, I was unable to find any sources comparing the infectivity of these theoretical transgenic HIV versus the wild type. However, even though it is theoretically possible that a transgenic replication competent lentivector can have better tropism than HIV by acquiring the VSV gene, the likelihood of that occurring is far lower than that of it being produced in the first place. Can a lentivector be detected by a HIV test? Regarding the final question of whether a lentivector can be detected by a standard HIV test, the answer is that the detection is possible if the person who was infected with lentivectors, has obtained an immune response to the lentivector gag proteins, and the lentivector loads are high enough. HIV tests are specific to different parts of the virus, but most of them target the viral protein p24, which is a component of the gag polyprotein. PCR based HIV tests also exist, but these tests would depend on the specific primers produced and whether the RT-PCR would produce an amplicon given the specific sequence of the plasmids. Since gag genes are encoded for in most lentivector systems, it is therefore very likely that anyone infected with a lentivector would therefore express antibodies towards p24, and therefore result in a positive for the ELISA as well as the Western blot tests assuming that the p24 and antibody quantities are high enough to reach the cutoff point. I was unable to find publicly available cutoff levels for the ELISA and Western blot levels, but if (hypothetically speaking) a person was injected with a load of lentivectors, they would likely test positive for HIV. However, since the lentivector is not actively reproducing, it would quickly be cleared out by the immune system. Not the answer you're looking for? Browse other questions tagged virology lentivirus or ask your own question.